To Cite: Sasan M S, Alborzi A, Ziyaeyan M. Epidemiology of Aseptic Meningitis in Infants and Children (Shiraz - Iran), Arch Clin Infect Dis. 2012 ; 7(4):116-8. doi: 10.5812/archcid.15086. Background: Viruses are by far the most common cause of meningitis in children. Objectives: The aim of this study is to describe the epidemiology of viral/aseptic meningitis (AM) in children (2 months - 15 years) in Shiraz. Materials and Methods: This is a cross-sectional prospective-descriptive study from May 2001 to May 2002 in Nemazi and Dastgheib Hospitals, Shiraz. EV meningitis was diagnosed using RT - PCR on Aseptic CSF samples. Mumps meningitis (MM) is defined (clinically) by simultaneous presence of parotitis and meningitis and negative PCR for EV. Clinical data were extracted from hospital archive files. Results: During the study period, 688 CSF samples (from 598 patients) were analyzed. Among these samples, there were 218 (36.4%) cases of meningitis. Twenty seven (12.38%) were bacterial [Streptococcus pneumonia (11 cases), H. Influenzae (8 cases), Neisseria meningitidis (5 cases) and other organisms (3 cases)]. The rest of the cases (191 patients) were considered as AM. RT - PCR for detection of EV was carried out on 53.4% (102 out of 191) accessible aseptic CSF samples. Among these cases, only 12.7% (13 out of 102) were positive for EV. Twenty patients (19.6%) with negative (Enteroviral) PCR, had parotitis and were considered as MM. Other causes of AM were found in 8 (7.8%) cases (Brain Abscess and Guillain-Barre syndrome, each one in 2 cases, Partially treated bacterial meningitis, TB Meningitis, Leukemic meningitis and Varicella encephalitis each were detected in one case). Conclusions: The cause of AM was found in 40.15 % (41 out of 102) of patients. Although at the time of this study (2001 - 2002) MM was the most common form of AM in children in Shiraz, Enteroviral Meningitis (EVM) was relatively close to it in prevalence (13 Enteroviral vs. 20 MM). Meningitis is the common cause of admission in all pediatric wards; the majority of pediatric meningitis are viral which do not need prolonged hospitalization. Differentiation between bacterial and viral meningitis is a complex and multi aspect issue, knowledge about the epidemiology of AM in each district is an important mean for decision making. The study is designed to examine the epidemiology of viral/aseptic meningitis (AM) in children between 2 months and 15 years in Shiraz. This prospective study was carried out during a one-year period (May 21, 2001 to May 20, 2002). During this period, both of the pediatric wards of the city were sending all their CSF samples to our Lab (Dr Alborzi Research Lab), after primary analyses (gram stain, latex agglutination, culture, sugar and protein measurement) the rest of the samples were stored at -70ºC. RT - PCR for EV was done, by a pan-enteroviral primer pair (Chapman et al. 1990), for all aseptic CSF samples with more than 5 WBC/mm3. In this study, a case of MM is defined by simultaneous presence of parotitis and AM accompanied with negative PCR for EV. Clinical data was extracted from the hospital files. From May 21, 2001 to May 20, 2002, 688 CSF samples from 598 patients were analyzed in our Lab pleocytosis (WBC > 5/mm3) of CSF (Meningitis) was detected in 218 patients (36.4%). Twenty - seven patients of 218 cases of meningitis had positive culture and/or positive gram stain of CSF [bacterial Meningitis (BM)], and the rest of the cases (191) were considered as AM. Streptococcus pneumonia infection in 11 patients (40.7% of BM cases) was the most common bacterial cause of meningitis. The additional causes were H. Influenzae (7cases) Neisseria Meningitides (5 patients). 41% (10 of 24) of BM cases were between 2 - 12 months old. The spring with 44.4% of infected cases (12 of 27 cases of BM) was the peak season for BM, only 2 cases (7.4% of BM) were detected in summer. RT-PCR for EV was performed on 53.4% (102 of 191) of accessible aseptic CSF samples. Among these cases, only 12.7 % (13 from 102) were positive for EV. Among 13 patients with EVM, 10 cases were boys (M/F = 3.1). Seven (53.8%) of the EVM cases occurred in summer, and winter with 3 cases stands as the second season for EVM. The Mean age of EVM was 7.5 years (8 months - 12 years). In clinical examinations, 3 (23%) of EVM cases had parotitis, conjunctivitis, prolonged (15 days) unknown fever and encephalitis each occurred in one patient. In the CSF of EVM cases, the Mean (and range) of WBC, neutrophils, sugar and protein were 232/mm3 (20 - 500/mm3), 36 % (2% - 98%), 49 mg/100 cc (21 - 75 mg) and 33 mg/100 cc (7 - 135 mg), respectively. Parotitis was found in 43 out of 191 AM cases, PCR for EV was done for 24 (55.8%) of them and the result was positive in three cases (12.5%). The rest of these 24 cases (21 patients) were considered as MM (MM). Among 21 cases of MM, 15 were boys (M/F = 2.5) and the Mean age was 7.42 years (range: 1 - 13 years). Most of the MM cases (10 patients, 47.6%) were detected in winter. Encephalitis was the clinical manifestation in 3 patients with MM, they have also complained of loss of consciousness (3 cases), seizure (2 cases) and ataxia (1 case). In CSF analysis of the MM group, the Mean (and range) of WBC, PMN, sugar and protein was 444.0/mm 3 (14 - 1300/ mm 3 ), 8% (2% - 27%), 53.85 mg/100 cc (30 - 91 mg) and 25.4 mg/100 cc (9 - 80 mg), respectively (Figure 1). As a general rule, lumbar puncture mostly rules out Meningitis rather than confirming it, therefore the majority of the CSFs have to be normal. The rate of infected CSFs with meningitis (which is 36% in this study), varies between 3.8% [in a report from Israel on 52 infants and young children with febrile seizure] up to 43% [in a study from Spain on a group of 471 febrile children (1 month to 14 years)] (1, 2). Viruses are the most common causes of pediatric meningitis. 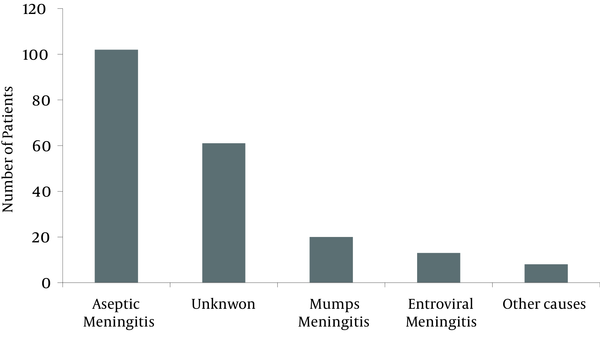 The reported rate of BM in all cases of meningitis varies from 5.5% in Spain up to 50% in the UK (3). This rate was 21.2% in US (Baltimore) (4) and in Iran, 16.3% in Mashhad (5), 23%in Shiraz (6) and 12.3% in our study. The low rate (less than 10%) of BM in comparison to all of the CSFs can be a sign of inefficient Microbiology Lab or because of high incidence of viral meningitis. The cause of AM can be found in 75% - 90% of patients. In a study from Portugal (using the PCR for EV and serologic test for Mumps), the authors could find the AM in 49.3% of cases (33.1% Mumps, 16.2% EV) (7). In a study on 612 cases of AM from Turkey, Mumps (by Parotitis and positive IgM) and EV (by cell culture) were detected in 50.7% and 17% of the patients, respectively (8). In our study, EV and Mumps together caused 32.3% of AM. Modarres (in Tehran before MMR) has found the AM in 63% of 430 children (Mumps 48%, EV 15%) (9). In a recent study (after MMR) in Shiraz, using PCR for detection of 7 viruses, the etiology of AM was found in 46.2% of cases , EV (43.3%) and Mumps (36.7%) together caused 80% of known AM in this study (6). Kumar detected Enterovirus RNA in 51 (45.5 %) of 112 CSF samples from children with aseptic meningitis (10). The Use of EV PCR as a routine test in diagnosis of infants and pediatric meningitis allows earlier discharge and decreases the inappropriate antibiotic treatment (11). In this study, the ratio of BM to AM was 12/22 (0.54) in spring, and 2/21 (0.09) in summer. This high difference in the prevalence of BM and AM in summer and spring makes clinical decisions in favor of AM in summer. In a study from the US, the rate of meningitis-associated hospitalization was highest in the summer, and this seasonal pattern was due to viral meningitis, for which 71.1% of hospitalizations occurred during a six-month period from May to October (12). The Mean age of Aseptic, Mumps, and EVM in our study were 6.7, 6.8 and 7.5 years respectively. In a similar study from Turkey the Mean age of EVM was 5.6 ± 3.4 years (8). In both of these studies (ours and turkey), the lowest point of the age curve of EVM is the first three years of life, but this finding is in contrast with the high prevalence of EV infections in infants. In studies in the US, the hospitalization rates for viral meningitis decreases 15 fold after the first year through 44 years of life (12). In the study of Modarres (Tehran - Iran) the mean age of EV and MM was 4 and 6.5 years respectively. In their study, 42.5% of EVM occurred in the neonatal period and only 15% were above age five (9). In the current study, comparison between Mumps and EV meningitis shows that MM is more common than EVM, the mean age of EVM and MM are close to each other and both of them are more prevalent in boys but this male predominance is more prominent in EVM. Total WBC of CSF in Mumps is more than 2 times of EVM but the percentage of PMN in CSF is more than 2 times in EVM. parotitis is not specific for MM, as 23% of EVM have parotid enlargement (Table 1). However in the study conducted by Modarres, children with EVM were significantly younger than children with MM (mean age of 47 M vs. 89 M), male predominance was more prominent in MM (M/F 2.07 vs. 3.43) and the PMN percentage in CSF was slightly higher in MM patients (9). We would like to thank Mr Kalani, Mehdi Nasiri, Jalil Rashidi, Mahmood Behrooz and Pourabbas for their technical support. Implication for health policy/practice/research/medical education: The study has been conducted for medical educational purposes. Authors’ Contribution: All authors collaborated equally. Financial Disclosure: No conflict of interest was declared. Funding/Support: This study was supported by Professor Alborzi Clinical Microbiology Research Center (Shiraz University of Medical Sciences).